Protect against color fade with the Redken Color Extend Conditioner; a nourishing formula that works to maximize color vibrancy while strengthening locks. 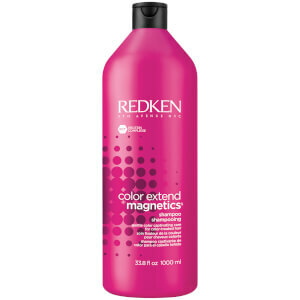 Utilizing a ‘Fade Resist Complex’ the conditioner offers superior color protection. A Micro-Net and UVA/UVB filters work in synergy to block color-fading aggressors and ensure color-treated hair remains luminous even after frequent washing. Complete with Cranberry oil, the conditioner delivers a veil of nourishing moisture to hair that leaves locks soft, smooth and ultra-shiny. Aqua/Water/Eau, Cetearyl Alcohol, Amodimethicone, Cetyl Esters, Cetrimonium Chloride, Parfum/Fragrance, Dipalmitoylethyl Hydroxyethylmonium Methosulfate, Trideceth-6, Phenoxyethanol, Benzophenone-4, Butylphenyl Methylpropional, Vaccinium Macrocarpon (Cranberry) Seed Oil, Hexyl Cinnamal, Chlorhexidine Digluconate, Linalool, Citronellol, Benzyl Alcohol, Geraniol, Arginine, 2-Oleamido-1, 3-Octadecanediol, Hydrolyzed Soy Protein, Coumarin, Limonene, Sodium Hydroxide, Hydrolyzed Vegetable Protein Pg-Propyl Silanetriol (D46887/2).